As a police officer in a small town in Maine, Sergeant Daniel Fitzpatrick is used to getting a lot of different calls - to pull over drunk drivers, or to help broken-down motorists or assault victims. But yesterday, he got a different kind of call - a woman had found two pygmy goats inside her garage, eating every bit of cat food that she laid out for them. "The woman who called had found them on High Street, and had somehow gotten them corralled into her garage, and she closed the garage door," Fitzpatrick, who works for the Belfast Police Department, told The Dodo. "She called the police department because we act as the animal control officers in Belfast." The woman was ecstatic when police arrived, according to Fitzpatrick. 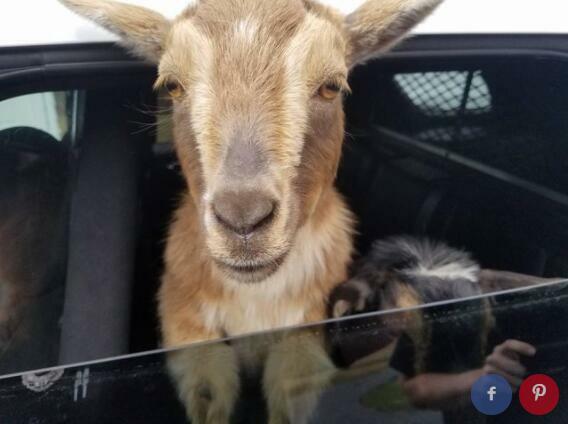 "She led us right to the garage, and when we looked out through the door, I saw two small goats jumping from one spot to another on a cat entertainment center, eating cat food," Fitzpatrick said. 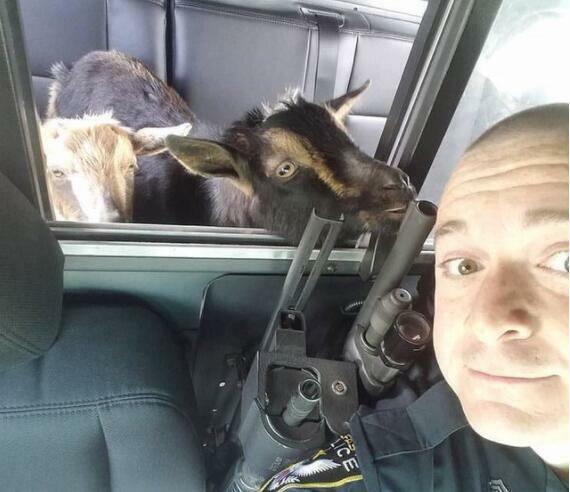 The goats, whose names turned out to be Louis and Mowgli, were very cooperative when Fitzpatrick escorted them out of the woman's garage to his police car. "They jumped right in, and off we went," Fitzpatrick said. The problem was, nobody knew where the goats belonged, and Fitzpatrick spent the next two hours searching, with the goats riding in the back. "It was a nice day yesterday, and I rolled the windows down," Fitzpatrick said. "Mowgli seemed pretty content just falling asleep in the back, while [Louis] went from window to window, sticking his head out and bleating like he was having a great time." "I thought it was a good idea to open up the sliding Plexiglas divider that separates the officer area from the area where we put people who are in custody," Fitzpatrick added. "I'd been feeding them little slivers of carrots throughout the day to kind of tide them over, and at one point, Louis kind of nuzzled my ear - he'd put his head through, and was trying to get my attention. I thought it was probably to get some more carrots, so I had to pull over and pass more carrots back to him, and off we went again." As it turned out, the goats belonged to people living directly across the street from the woman who found them. 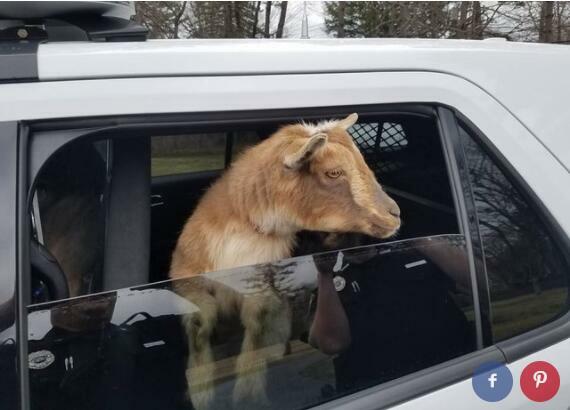 While no one knows how they escaped from their yard, Fitzpatrick thinks the goats were just taking advantage of the nice day, and had decided to go for a stroll. "[The owner] didn't even know that they were missing at first, but then she was very happy that nothing had happened to them, and she was just very glad that we took care of them while we could," Fitzpatrick said. Louis and Mowgli are now safely back at home, which Fitzpatrick is pleased about. At the same time, he can't help but miss his new goat friends. 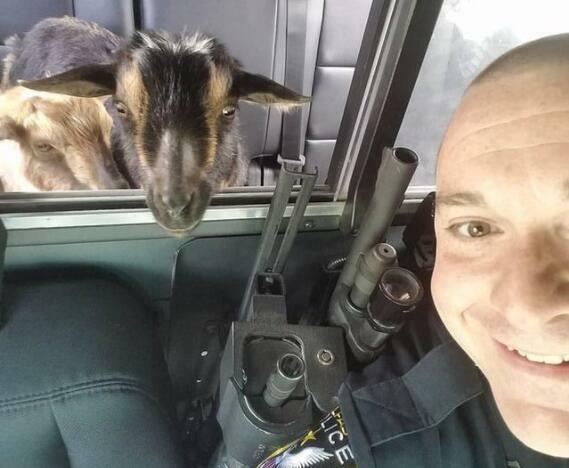 "I can tell you that the goats were a lot better behaved and cleaner than some of the [people] we've had on the back of our control cars as of late," Fitzpatrick said. "They were a pleasure to have along. We had a fantastic time.